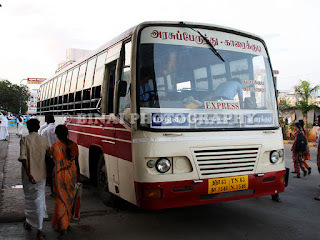 This bus was operated by one of the most established operators in the region - MS Menon Transports. They operate some 7-8 buses on this route, and I had seen as many as 5 of their buses during by 25 minutes of wait at the bus stop. The driver was cautious for most of the time, and he checked with each oncoming bus about the scenario at Kodungallur. Although he received one negative reply, the driver decided to go ahead. The bus dropped me at Kodungallur, and I began my next wait. At the end of about 5 minutes, there was no sign of a KSRTC bus. The period between 0630 and 0715 sees a bus to Ernakulam, almost every 3-5 minutes. I checked up with a person waiting at the bus stop - he said no KSRTC buses came in the past 15 minutes. Just then a private bus heading to Ernakulam came at the bus stop. The bus was crowded to the core, but had no choice but get in. I took a ticket to Moothakunnam, the place where Kodungallur taluk ends. 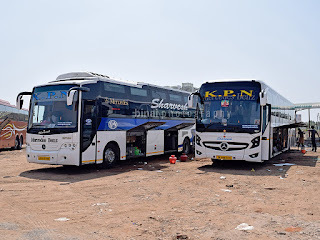 I was aghast at seeing KSRTC buses lined up at this place - all KSRTC buses were avoiding Kodungallur on the day. The reliability image of KSRTC goes there to the thrash can. The same story repeated at evening. While Private buses were operating to Kodungallur town, KSRTC decided to support the hartal and skip the town. 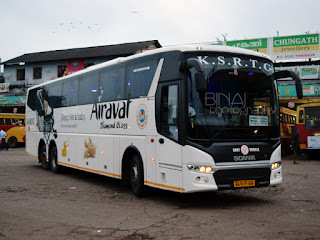 I was seriously disappointed by the way KSRTC reacted on the particular day - instead of supporting the traveling public, they decided to support the hartal, which was nothing but an unwarranted disturbance to normal life. Private buses are always slammed for being unreliable - since they usually keep away from towns afflicted by the hartal fever. This was one helluva eye-opener for me. The unreliable turned reliable. Hope KSRTC gets its act together, and gets to the habit of not stopping services at the behest of mischief mongers.